Size of Male: 13-18 lbs., 12-13 in. Size of Female: 13-18 lbs., 12-13 in. A tad larger than some toy breeds, the Cavalier King Charles Spaniel is an extremely friendly and affectionate breed designed to be the perfect lapdog. Because they get along well with adults, gentle children and most other animals, they are overall a very easy pet for a family. This breed has four recognized colors: Red and white, black and tan, red, and tricolor (black, white and tan). The Cavalier King Charles Spaniel that we know today is the end result of several breed mixes, including smaller European Spaniels and Oriental toy breeds of a smaller size. 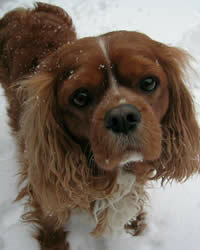 In fact, the Cavalier Spaniel is believed to have originated as recently as the 20th century. Its ancestor, the King Charles Spaniel, has ample history in paintings during the King Charles II era of the 17th century, and by all appearances has been known solely as a loyal lapdog that rarely worked or performed a laborious function. The current breed is thought to also contain a mix of Pugs, which helped shape its current appearance. The Cavalier King Charles Spaniel is so friendly as to often appear aloof and energetic. This breed is known for its affectionate behaviors and happy disposition. Although this toy dog breed is suited for pampering, as with all dogs it is important to establish yourself as pack leader in order to avoid many common obedience issues. Cavaliers get along well with other dogs and gentle children, and almost never show aggression. Living Environment – Cavalier King Charles Spaniels are ideal for any living environment and they make good apartment dogs. Exercise is important for their heart, but long jogs are rarely necessary and they can do without a large backyard. Grooming – This breed does not have many difficult grooming requirements. Its hair is prone to tangling and it is a medium shedder, so brushing roughly two to three times a week is important. It should also have its ears checked and cleaned regularly. Diet & Exercise – All Spaniels need good exercise, so regular long walks are important, daily if possible. The Cavalier King Charles Spaniel in particular is prone to heart problems, so daily walks are even more important for this breed to help strengthen its heart. This breed is generally not counted among overweight dogs, but canine diabetes can be a problem. Accordingly, diet should be monitored and human food should be avoided. Health – This Spaniel breed is prone to several genetic dog health problems. One such issue is Mitral-valve Disease (a heart murmur that ultimately leads to heart attack), which is why constant exercise is important. As many as 50% of all Cavalier King Charles Spaniels have this disease by age five, and almost all of them have it by age 10. Another genetic disease is known as Syringomyelia, where the spinal cord pushes at the brain and causes paralysis. Canine hip dysplasia, episodic falling and several dog eye problems are also more common in this breed, including keratoconjunctivitis sicca, which can lead to blindness. The Cavalier King Charles Spaniel is moderately trainable. Its willingness to please makes it a happy learner, though it can take slightly longer to pick up new tricks. Still, it has the intelligence to learn with all types of training, so anyone that enjoys dog training will enjoy this breed.